The Mahabharata is at once an archive and a living text, a sourcebook complete by itself and an open text perennially under construction. Driving home this striking contemporary relevance of the famous Indian epic, Mahabharata Now focuses on the issues of narration, aesthetics and ethics, as also their interlinkages. 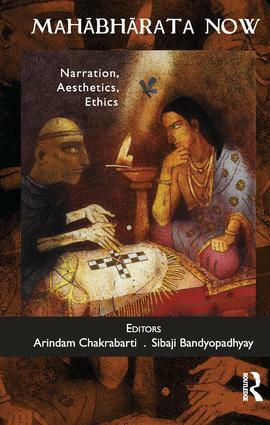 The cross-disciplinary essays in the volume imaginatively re-interpret the ‘timeless’ classic in the light of the pre-modern Indian narrative styles, poetics, aesthetic codes, and moral puzzles; the Western theories on modern ethics, aesthetics, metaphysics, psychoanalysis, and philosophy of science; and the contemporary social, ethical and political concerns. The essays are all united in their effort to situate the Mahabharata in the context of here and now without violating the sanctity of the ‘written text’ as we have it today. The book will be of interest to scholars and students of Indian and comparative philosophy, Indian and comparative literature, cultural studies, and history. Arindam Chakrabarti is Professor, Department of Philosophy, University of Hawaii,Manoa, USA. Sibaji Bandyopadhyay is Professor of Cultural Studies, Centre for Studies in Social Sciences, Calcutta (CSSSC), Kolkata, India.